A dedicated source for manuscripts and critical editions. Michael Embach und Martina Wallner. Conspectus der Handschriften Hildegards von Bingen, Münster: Aschendorff Verlag, 2013. Jennifer Bain. Hooked on Ecstasy: Performance 'Practice' and Reception of the Music of Hildegard von Bingen. The Sounds and Sights of Performance in Medieval and Renaissance Music: Essays in Honour of Timothy J. McGee (Ashgate, 2009), 253-273..
Catherine M. Jeffreys . Melodia et rhetorica: the devotional song repertory of Hildegard of Bingen. PhD thesis, Faculty of Music, University of Melbourne. 2000. Jeannette D. Jones. 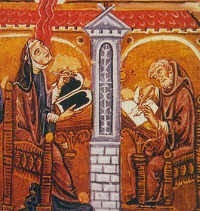 A Theological Interpretation of Viriditas in Hildegard of Bingen and Gregory the Great Portfolio of the Department of Musicology and Ethnomusicology. Boston University. Accessed online 21 July 2014. Beverly R. Lomer. Music, rhetoric and the creation of feminist consciousness in the Marian songs of Hildegard of Bingen (1098--1179. PhD Dissertation. Florida Atlantic University 2006. Christian McGuire. Symphonia Caritatis: The Cistercian Chants of Hildegard von Bingen. presentation at International Congress on Medieval Studies, 2008. Christian McGuire, Symphonia Caritatis: The Cistercian Chants of Hildegard von Bingen. M.A. Thesis. University of Minnesota 2007. Constant J. Mews. Process Thought, Hildegard Of Bingen And Theological Tradition Monash University:Melbourne. 2000..
A Companion to Hildegard of Bingen. Debra Stoudt, George Ferzoco, Beverly Kienzle ed. Brill: 2013. Friedrich Wilhelm Emil Roth, "Glossae Hildigardis", in: Elias Steinmeyer and Eduard Sievers eds., Die Althochdeutschen Glossen, vol. III. Zürich: Wiedmann, 1895, 1965, pp. 390-404.
in Deutsch: contains an extensive bibliography of works related to Hildegard von Bingen.